Dragon Ball Z has always had some crazy hairstyles. Many anime since have had even more ridiculous hair, but DBZ was a pioneer, with its blonde Super Saiyan transformation primarily marked by a change in hairstyle. 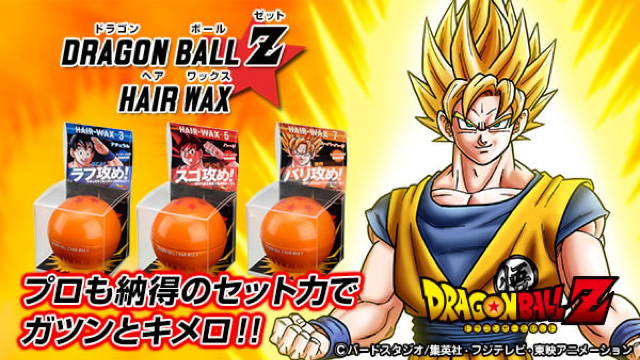 So now, 17 years after the show went off the air (yes, there have been sequel series, movies, and rereleases since), you can finally buy official DBZ hair wax for making your own hair stick up. They come in three levels, marked by how Goku’s hair looks: 3 (Goku’s regular hair), 5 (Goku using Kaio-ken), and the strongest hold, 7 (Super Saiyan Goku). Best of all, the hair wax comes in Dragon Balls! This seems to be a Japan-only product, but it would be awesome to see this released in America whenever the movie DBZ: Battle of Gods is released.